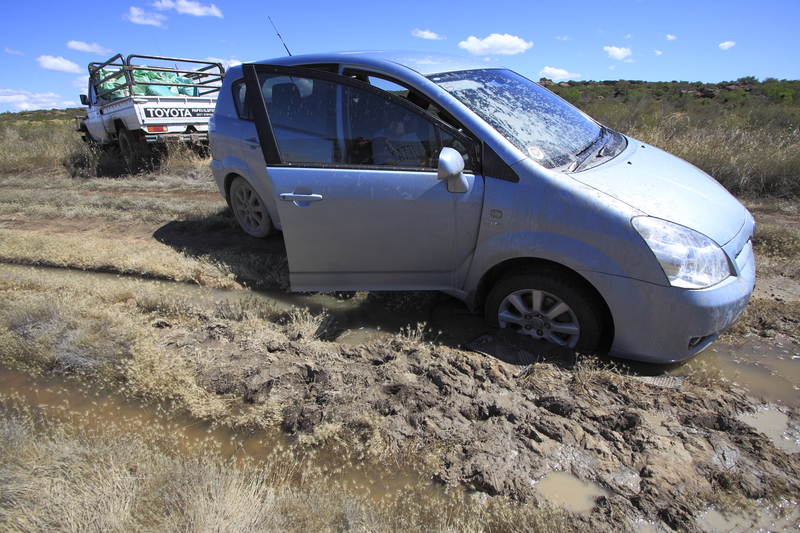 As promised, some more on our little journey north to Papkuilsfontein…and the rare rain that followed us there! As we drove into Clanwilliam it started spitting politely. By the time we hit Vanrhynsdorp, it was sheeting down… and large lakes (with waves) were forming in the main road. We looked at one another wide-eyed. We had thought we were coming to the parched Great Karoo, where it NEVER rains! The thought of being cooped up in a cottage for 4 days with a hyper 7 ½ year old was NOT good, so we screeched to a halt outside a modest little shop (one of about 2 in the town) that caters mainly for farmers and asked if they had any rain gear (we had packed nothing for wet weather). We walked out happy, with three bright yellow rain suits (made for farm-workers) – ready for action. All kitted out in yellow the next day, on our first very soggy hike, we came across the most brilliant little creature. One which we feel completely blessed to have seen…and were able to watch for a good 10 minutes! By all accounts they are rarely encountered and certainly do not usually just hang about to be admired as this one did. 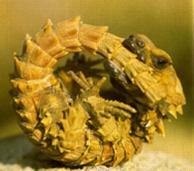 The Armadillo Lizard is quite an extraordinary reptile. When threatened, it curls up into a ball much like its namesake – the Armadillo! Warren kicked himself for not having his camera on him (it was bucketing when we had set out)…but we have the memory of this little chap firmly planted in our minds. This is a photo I have borrowed from the ‘net just to show you how special he is. This was just one of many other superb wildlife sightings on this farm…more of those tomorrow. For a laugh, this is a pic of us getting completely stuck on Day 3….on our way to the start of one of the hikes. My poor little car just couldn’t quite pull off the 4×4 thing for this particularly soggy stretch. The farmer, Jaco, very kindly came down a couple of hours later to haul us out with his Toyota Landcruiser. He too got very impressively wedged in the mud for a good half an hour before he was able to get to us!! This entry was posted in Travels, Wild sightings. Bookmark the permalink. Ouch! Glad there was a handy farmer on hand, tempers can fray at such times! Wonder who it was that spotted the Armadillo Lizard – clever thing whoever it was. Glad you enjoyed Papkuilsfontein, definitely a favourite of Simon Greenwood who eulogises about it in the Greenwood Guide. We went in winter and gave it mixed reviews – just bad luck, clearly! Lucky to see Cordylus cataphractus – probably close to the edge of its range and is normally very wary as you noted. Love the little Armadillo Lizard chap. Rolled up like that reminds me distinctly of a yoga pose I’ve watched in utter disbelief.